1893, Sep 9 Enrolled Grand Haven, MI. 1897, Sep Owned Heath & Kincaid, Saugatuck, MI; ran river route Saugatuck to New Richmond; 68 x 23. 1898, Apr 30 Renamed KLONDIKE. 1898, Jun Owned D.A. Heath, Saugatuck. Email your Order Comment on this item Create electronic postcard 1900 Kalamazoo River. 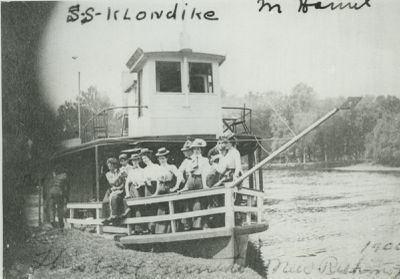 As KLONDIKE, Saugatuck, MI, c1900.